Superbe townhome de trois chambres surplombant la rivière Eagle avec vue imprenable sur la rivière et la montagne et à quelques minutes de la nouvelle télécabine d'Avon! L'utilisation généreuse de verre améliore les vues dramatiques de cette townhome spacieuse (1800+ pieds carrés) Plan d'étage merveilleux et emplacement renversant de rivage qui fait sens économique. Situé à l'entrée principale de Beaver Creek, vous ne pouvez tout simplement pas vous rapprocher sans payer le gros prix. Ski-out de Vail, Beaver Creek, et Arrowhead tous par de courtes promenades en navette à moins de 40 mètres de votre porte. Navette gratuite de la ville accède facilement centre de loisirs, bibliothèque, boutiques et restaurants. À quelques minutes de Beaver Creek et de toutes les commodités d'Avon. Hébergement magnifique, gestion hautement professionnelle et service sur place, à des tarifs très raisonnables le soir et la semaine. Our family of five adults stayed five nights in this well-equipped and conveniently located condo in Avon at the base of Beaver Creek. Property manager Matt B. made checking in/out a breeze. Pictures don’t convey the charm of the place. Easy transportation to and from BC. Avon’s full of good restaurants and saloons. 5 stars. This property is wonderful. It is close to everything and very well equipped. We had a great stay at this property. It is spacious, had seven people and it worked well. The property had everything. Plenty of towels, linens, and kitchen supplies. Matt the property manager was great. He was very attentive to any need. If we return we will definitely stay at the property. We could not have been more pleased with our stay. Beautiful condo with everything you could ask for and more, from the comfy beds to the fluffy towels. It's easily accessible from I-70 and has several restaurants and grocery stores that are within walking distance from the condo. The Eagle River runs right next to the condo, open the bedroom windows to listen to the rushing river at night and I guarantee you will not have a better night sleep. Beautiful condo in the perfect location!! We stayed at this beautiful condo Fourth of July week. Not only is it beautiful, it is in the perfection location, sitting right on the edge of the Eagle River. Not only do you have the wonderful view, you can sleep with your windows open and listen to the peaceful sound of the water all night long. 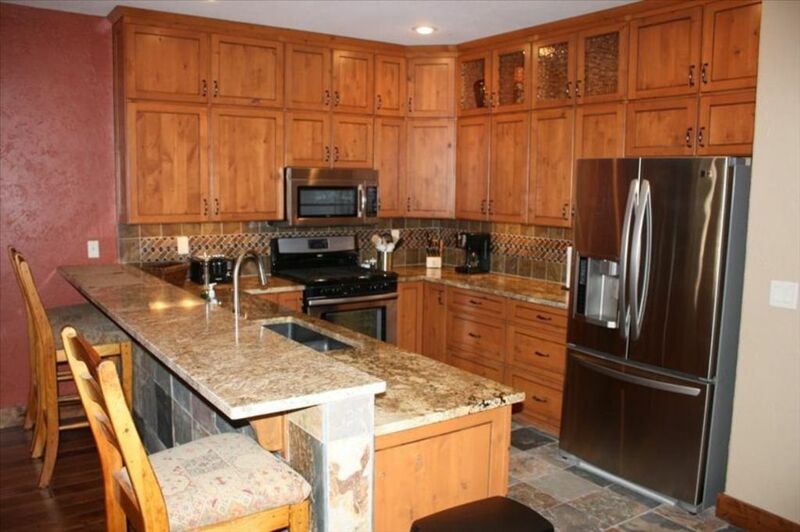 It is beautifully decorated with a large kitchen and plenty of space to gather. It is in walking distance to the Rodeo, which operates during the summer, walking distance to many restaurants, and to the local grocery store, the City Market. Nottingham Park is in the middle of town and has a great lake with swimming, paddle boat rental and paddle board rental. There is also an easy walking/biking path that takes you along the river. We rode bikes to Edwards and ate lunch and walked through the little shops. From the condo, you can walk a block over to Beaver Creek and either walk up or take the shuttle. The lift is open during the summer so we were able to take the lift up and enjoy the amazing view and some great hiking. There are lots of trails once you get up to Beaver Creek. Our favorite is the Village to Village walk. It is an easy four mile walk that takes you to the Ritz Carlton in Bachelor Gulch. From there you can either call the shuttle to go back to the bottom or back up to Beaver Creek to shop and get a bite to eat. We will definitely be back to stay at this beautiful place again. This property is really a gem! It’s clean, well maintained, and next to the most relaxing babbling brook! We walked to Starbucks every morning, grocery store near by, and spent our evening relaxing on the deck. We are counting the days until we can go back and stay here again!